A large ginger with huge leaves and swollen bases. Bright red bracts develop at the base of the plant, from which tiny pink and white flowers grow. Later, round red fruits develop inside these fading bracts, immersed within a snot-like substance. Ground birds such as cassowaries and megapodes eat the fruits (Nicholson and Nicholson 200). The plants are usually found on the edge and in gaps of the tropical rainforest in northern Queensland, New Guinea and some other Pacific islands (Nicholson and Nicholson 2000). The plant is often called Native Cardamom' as the seeds have a similar flavour to the related Asian plant. 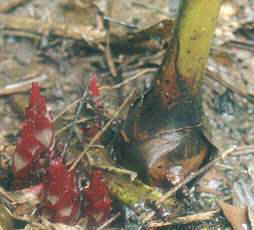 The seeds and pulp of this plant are edible, and the leaves were used for wrapping food (Nicholson and Nicholson 2000).